A new front has broken out in the battle over bicycle infrastructure in Baltimore. 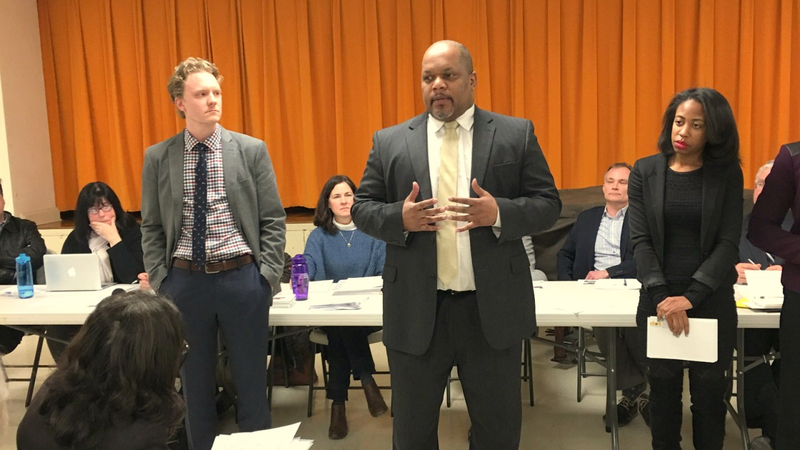 Just as the Pugh administration declares it won’t back down from a plan to redesign a protected bike lane in Canton – and her top aide privately blames the Rawlings-Blake administration for the program’s flawed roll-out – the Roland Park Civic League has called on the city to remove the cycle track on Roland Avenue. In a letter on Tuesday copied to Mayor Pugh and aide James T. Smith Jr., the Civic League requests that acting Department of Transportation (DOT) director Frank Murphy “immediately and completely” restore curbside parking on Roland Avenue. 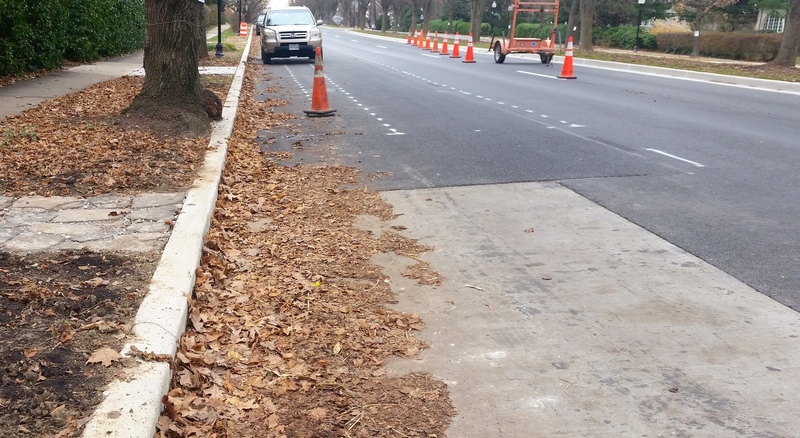 The mile-long cycle track was part of the $6.7 million Roland Avenue Traffic Calming Project, a DOT effort that necessitated a major curb reconstruction in 2015 and boasted cost overruns of 72%. To install the cycle track, curbside parking was replaced by two four-foot-wide lanes whose location roiled many in the community. 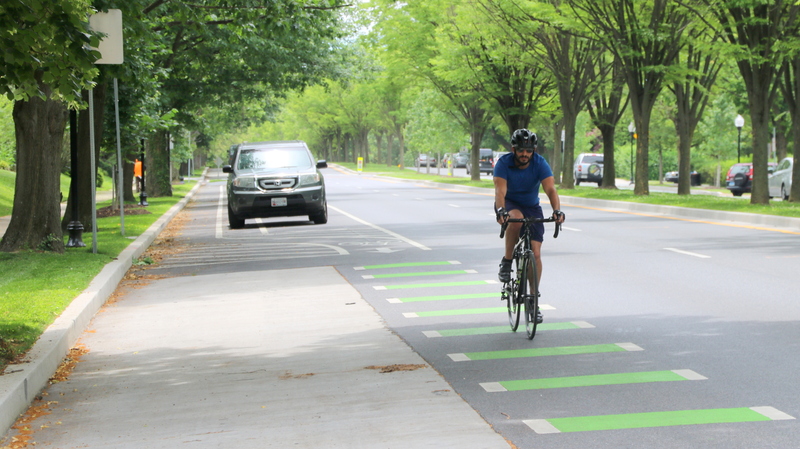 With stationary cars serving as a buffer between the bike lane and and moving traffic, the project was hailed by the city as state-of-the-art infrastructure that would make cyclists safer and encourage more people to ride bikes. What’s more, conflicts between cyclists and turning cars (whose sightlines are often obscured by the parked cars) have resulted in five crashes, none causing serious injury. “Ongoing highly dangerous safety problems” exist between bikers and pedestrians on the 5100 block of Roland Avenue, where Eddie’s Market and the public library are located, and on the 4700 block, where preschool classes are held at St. David’s Church, the study said. The committee also reports that many cyclists avoid the leaf-strewn cycle lane and instead pedal amid the moving traffic. Either restore curbside parking with a wider, safer bike lane and slower traffic, or partner with the community to create a complete street that works for everyone. Restore curb side parking immediately and completely on Roland Avenue and continue the work of the committee to achieve the other objectives (included in the year-end report). Asked to comment on the Civic League’s action, a spokesman for the advocacy group Bikemore said it has long advocated for reducing Roland Avenue to one car travel lane in each direction. A “constrained facility” was built instead, said Bikemore policy director Jed Weeks. But a Civic League member said Weeks mischaracterized the group’s position. “All options included in the report that include curbside parking are still under consideration,” the League member said last night. The cycle track was championed by former DOT director William Johnson as part of a “complete streets” repaving of the thoroughfare. Johnson left city government last April. Prior to the installation of the track, Roland Avenue had a traditional bike lane running between moving traffic and parked vehicles. That pattern remains on the roadway south of Cold Spring Lane and between Northern Parkway and Lake Avenue. Adding to the confusion over the future of the city’s bike-lane program are public and private statements coming out of City Hall. 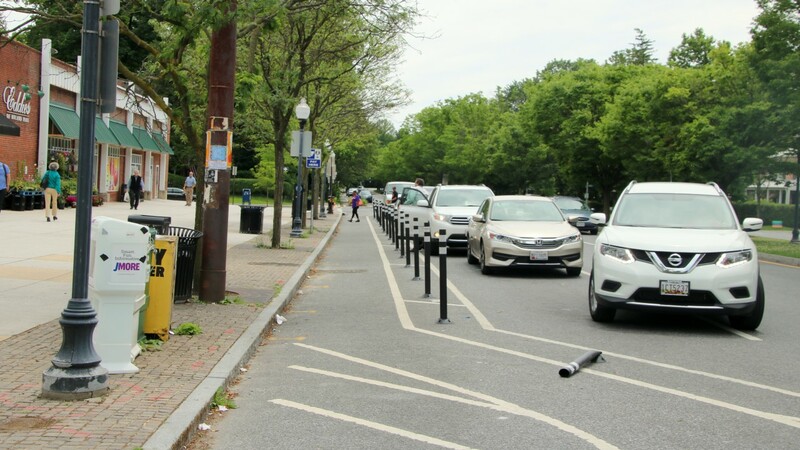 Yesterday Mayor Catherine Pugh said her concern about bike lanes was limited to the Potomac Street track in Canton and the administration’s discovery that the roadway failed to meet the 20-foot-clearance standard of the fire code. “We look forward to holding the mayor accountable to this claim, particularly in respect to the miles of reverse angle parking that have been installed during the same time period as the Potomac Street planning process that fail the 20-feet-clear standard and the many major development projects underway in the city that have planned streets under 20-feet clear. Behind the scenes, meanwhile, Jim Smith has been critical of the program’s implementation. In a private email responding to concerns expressed by a bike rider last week, Smith blamed the Rawlings-Blake administration and DOT’s consultants for mishandling the matter in Canton. “We only became aware of the Potomac St. issue when it was in crisis as it was initiated under the prior administration. I would have expected that the City’s consultant would have raised the conflict before finalizing his design recommendations, but that did not happen,” Smith wrote. “We will now have to balance traffic safety & the fire safety responsibilities in our neighborhoods to reach a result that supports our intention of being a multi-modal city that also protects people in their homes & businesses,” he added.